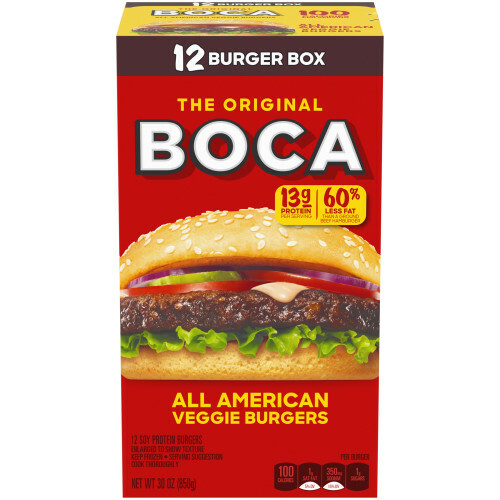 BOCA All American Veggie Burgers are a delicious frozen entree packed with protein and fiber, and these soy burgers contain 55% less fat than a ground beef hamburger. These vegetarian burgers are made of veggie protein flavored with herbs, spices and cheese, so they taste just like the real thing. Packing 13 grams of protein, these veggie burger patties are easy to make, and they're a perfect choice for those who are on a weight loss regimen. For a quick and delicious veggie meal, heat each meatless burger on a grill or stove top, and you can also cook them in your conventional or microwave oven. WATER, SOY PROTEIN CONCENTRATE, REDUCED FAT CHEDDAR CHEESE (PASTEURIZED PART-SKIM MILK, CHEESE CULTURE, SALT, ENZYMES, ANNATTO [COLOR], VITAMIN A PALMITATE), CORN OIL, WHEAT GLUTEN, CONTAINS LESS THAN 2% OF CARAMEL COLOR, METHYLCELLULOSE, SOY PROTEIN, DRIED ONION, CHEESE POWDER (CHEDDAR CHEESE [MILK, CHEESE CULTURE, SALT, ENZYMES], CREAM, SALT, SODIUM PHOSPHATE, LACTIC ACID), SALT, NATURAL FLAVOR (NON-MEAT), HYDROLYZED SOY PROTEIN, DISODIUM INOSINATE AND DISODIUM GUANYLATE, SESAME OIL, SPICES AND HERBS, DRIED GARLIC, MANNITOL, YEAST EXTRACT.